Winter Weather Wonderings: What’s in store for SE AK? After a couple very mild winters this one is feeling different. Northern southeast Alaska has been cold and windy virtually all November while farther south things have been close to normal or a little below. 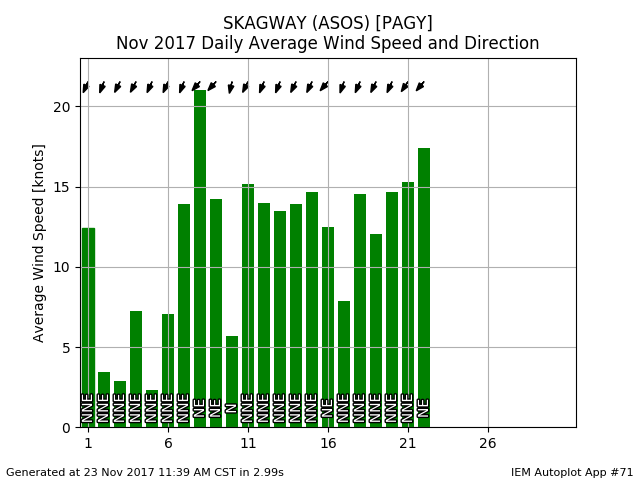 The wind graph for November in Skagway shown below is very telling of the strong outflow winds that have brought the cold down out of the interior. Thanks to Iowa State University for their plotting tool. The winds funnel down the valleys with force, but are often strongest over the waters of the Inside Passage where long narrow channels like Lynn Canal provide a low-resistance path to the low pressure over the open ocean. These winds, the rough seas they kick up, and the cold temperatures that are part of the deal mean freezing spray can be bad, especially for vessels fighting into the wind. The smaller ferries in the Alaska Marine Highway fleet sometimes have to cancel the northern Lynn Canal run for this reason. We’ve had a couple cancellations already this winter, and some air taxi flights cancelled too due to the wind (in addition to flights cancelled due to snow, usually during a different weather pattern). 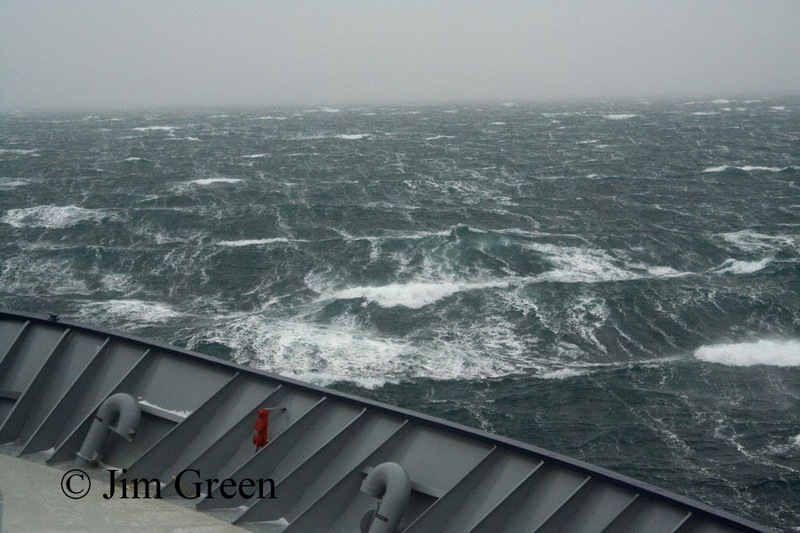 Here’s the view from one of the larger ferries pushing against a similar winter northerly back in January 2010. Is this a taste of things to come? I say more likely than not, and there are a few factors that lead me to this conclusion. We’re in a weak La Niña and it is forecast to continue through the winter. This phase of the tropical pressure/sea surface temperature oscillation favors cooler and drier weather in most of the state. More on this topic from the Interior & Northern Alaska Weather & Climate Blog and Climate.gov. 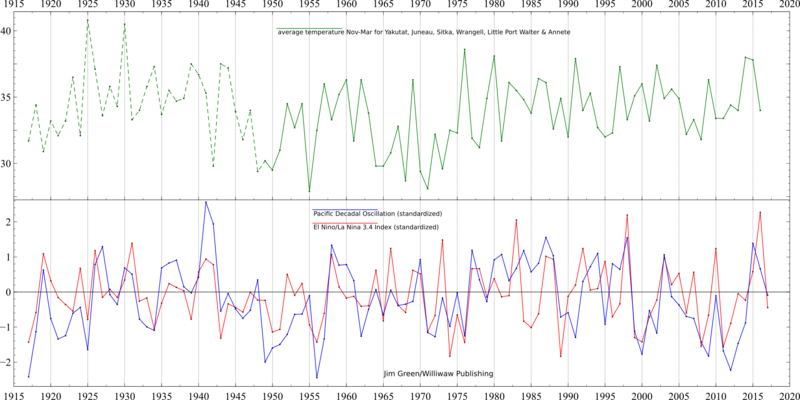 The Pacific Decadal Oscillation tends, as the name implies, to change phases on a decades long scale vs the year or two switching of the El Niño/La Niña. When it wallows in negative territory, cold winters are more common than warm ones or middle of the road ones. Right now it is not wallowing negative but looking at the bigger picture it seems to want to. More on this topic from NOAA and the University of Washington, the pioneers of the PDO. Here’s a graph for you graph lovers. The upper panel is a timeline of winter (Nov-Mar) average temperatures averaged from 6 SE Alaska stations with decent long-term temperature records. The lower panel shows the wanderings of the El Niño/La Niña (red) and PDO (blue). Click to enlarge and see the detail, and see how you think things correlate. The biggest thing I notice is that through about 1998 there is a pretty strong relationship between the ocean/atmosphere indices (PDO & ENSO) and the winter temperatures in SE. Since then the plunging indices are not well matched by cold winters. I’m wondering why not? Warm winters don’t seem to have gotten warmer. Regional Sea Surface Temperature (SST) anomalies (like the blob). General climate warming which is not reflected in the indices. Regional forcings not reflected in indices such as the loss of sea ice in the Beaufort Sea. These could cause a change in pressure/wind patterns resulting in changes in temperatures in nearby regions. Bad temperature data, which could be due to to changes in location, instrumentation, procedures, station surroundings, etc. Less likely with six stations represented. Changes in cloud cover. Winter clouds in cold places prevent radiational cooling and so can dramatically moderate low temperatures without there necessarily being a large change in the overall climate system. Reduced glaciation in the vicinity of the stations? The direct relationship between the water temperature off southeast Alaska and the weather is still subject for detail refinement, but the idea that warmer water helps warm onshore temperatures is not hard to accept. During the roughly three years that the warm “blob” ruled the waves off the coast of British Columbia and Southeast Alaska (2013-2015, again roughly) we had two of the warmest winters on record in SE AK. For more on this topic see the blob tracker. This is not cheating. Forecasting what is already occurring is called the “persistence” forecast and it can take into account factors of which we know little or nothing. It is also a little humbling to fall back on this tactic, realizing how little skill we have at forecasting more than a few days out. They are fairly confident of colder than normal weather in Southcentral through Southeast, but warmer in the Northwest and far west. I’m wondering what you are wondering about. Questions, comments or seasonal forecasts can be left via the comments form.